The eastern Sierra summits have long been a year-round mecca for skiers, snowboarders, cyclists, hikers, fishers and campers. Increasingly, those outdoor enthusiasts have had to share their alpine wonderland with betrothed urbanites seeking a wedding locale characterized by stunning geography, 300 days of sunshine, fresh air, adrenaline-fueled adventures, blue sky, actual seasons and kooky small-town warmth. 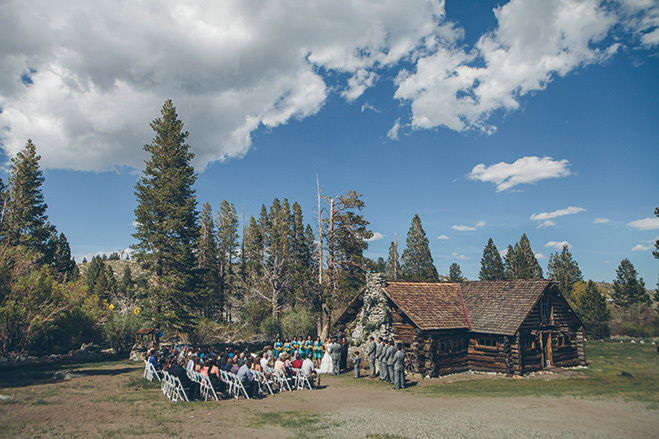 Getting hitched at high altitude has never been easier, thanks to a growing number of quality venues and vendors, as well as more frequent, albeit no less nerve-racking, flights (which is why Alaska Airlines provides complimentary wine and beer) and plenty of places to put up out-of-towners. Mammoth Lakes, just five hours north of Los Angeles, has a craft brewery, tourism guide app (Visit Mammoth) and free public transportation within its 4 square miles. You can find artisan breads and farm-to-table organic bites (Bleu Handcrafted Foods), macarons (Mimi’s Cookie Bar), gluten-free goodies (Mountain Cakery), and eco-conscious and egalitarian planning (Green Fox Events). There’s no reason to settle for a big day when you can have a mammoth one. 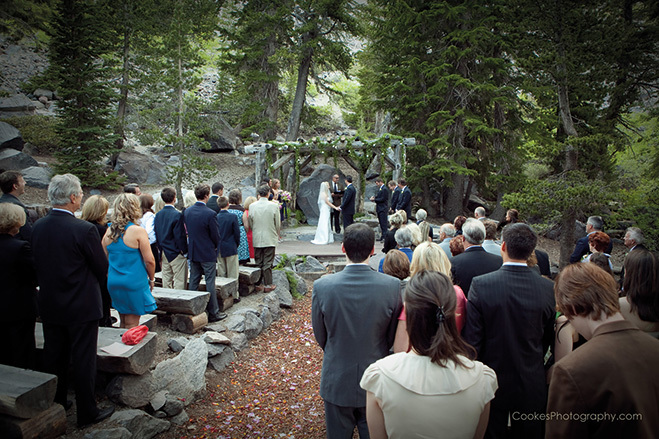 Saying I do at 11,053 feet at this namesake ski resort might be Mammoth’s quintessential matrimonial experience. First, send the crew up the mountain via snowcats or glass-sided gondolas—be sure to take photos with the Instagram-able vintage gondola on display—to The Summit, an open-air area atop the highest peak where the slopes start; or to its indoor equivalent, Eleven53. Either way, there’s nothing but snow-clad ranges for miles. If there’s powder, brave souls can shred down the slopes (or bike down after the melt) to 9,600 feet, where McCoy Station offers a vast room for 250. Prefer something less casual and have a RSVP list with fewer than 100 names on it? Rent out Parallax, a fine-dining private club tucked into the back corner of the outpost. It’s pure elegance, with dark wood accents, 50 shades of gray, in-wall metal fireplaces, metal hoop light fixtures and soaring windows with clear shots of the jagged Minarets. Kids at heart can hire Woolly, the fuzzy company mascot, to don his top hat and tails. This 211-suite boutique offering, just up a steep staircase from a thriving shopping, dining and entertainment complex, is so well maintained and embellished with au courant adornments, you’d swear it must have opened last year instead of in 2007. It also promises the same amenities that guests have come to expect from the Westin brand, such as wellness programs and Heavenly Beds. 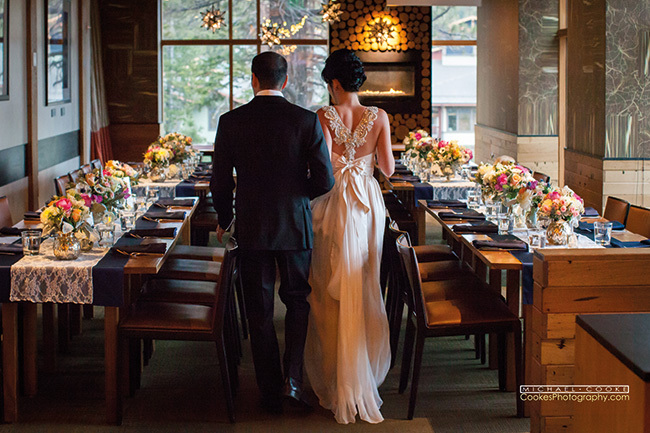 The woodsy design and neutral/pearlescent color schemes of the ballroom and Whitebark restaurant, both of which hold 100 and serve customizable menus focusing on seasonal ingredients, take cues from the surrounding environment. “I dos” are typically staged poolside, where you will also find a barbeque to use free of charge for a welcome picnic. The larger lodgings, with kitchens, fireplaces and window seats, provide excellent staging areas for the bride and her maids. 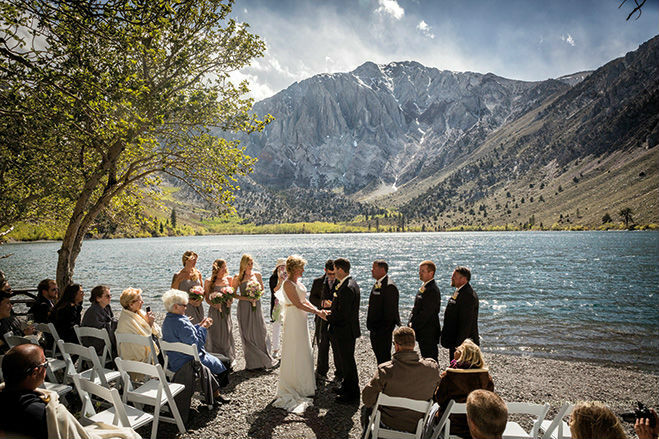 Outdoorsy pairs should answer the call of the wild at Convict Lake, which, hands down, has the coolest backstory of any of the vicinity’s venues (prison break, manhunt, shoot-out, oh my!). Exchange vows on the shore, surrounded by seasonal foliage, curious critters and unparalleled vistas of craggy rocks, tall trees and the mirror reflection of both on the glassy clear blue water. Branches have bent over the main path to form an undeniable Kodak moment. Small groups can be taken to a more remote spot at the back of the lake by pontoon or horseback, or use the yard at one of the three deluxe villas that are part of the namesake resort. The Restaurant at Convict Lake, which has the ambiance of a rich uncle’s ranch house and offers some budget-saving all-inclusive packages, can do a little of everything, from s’mores stations, pizza and taco bars to brunches, buffets and plated multicourse meals. Buyouts ensure privacy, but there are several private rooms as well as an aspen grove that can be left in the open air or tented. Encourage guests to stay on the property to avoid the dark 15-minute drive back up the highway. Built by Lakers owner Jerry Buss in 1967, the best thing about this resort, which is reminiscent of a ski chalet, is that an entire weekend of functions can be planned on the property without any venue recycling. Kick things off with a moonshine mixer by a roaring fire in the old-timey main lobby. Grab nightcaps in Duke’s Bar, named for once frequent visitor John Wayne. Get pampered in the spa/nail salon. Organize a tetherball, air hockey or miniature golf tournament at Frosty’s. Play pool or float in one after picnicking at the tables. Hire the tricycle to roll by with ice cream or bottle service. Instigate a dance-off in the giant parking lot. For the big day, eschew the plain meeting rooms to go global at any of the three restaurants: Rafters (new American), Red Lantern (Chinese) or Jimmy’s Taverna (Greek/seafood). Jimmy’s, with its blond wood, shutters, dangly star lanterns, splashes of blue, mosaic flooring, bold patterns and lit tree-branch installations, offers the most eye candy for as many as 120. (Not to mention fresh seafood and wood-grilled meats.) Your canine ring bearer is also welcome here. 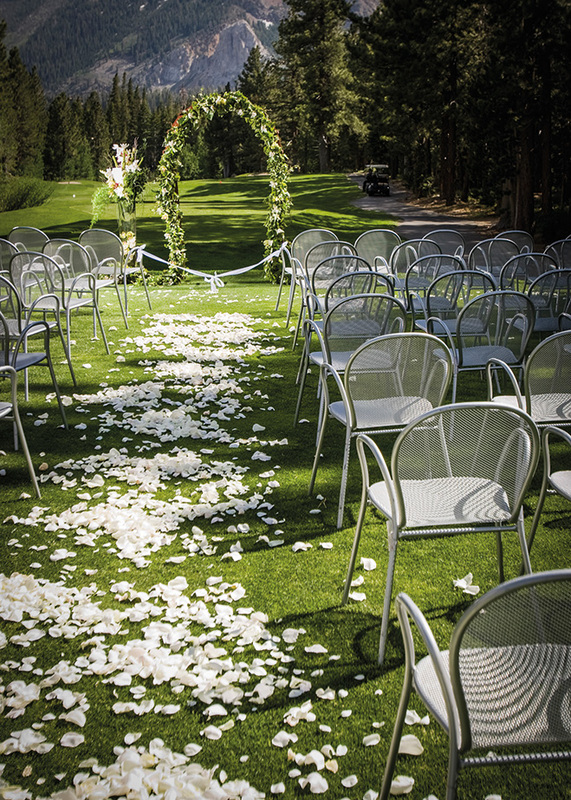 For a Midsummer Night’s Dream–style matrimony, march your processional across a charming footbridge, past the crystalline Twin Lakes, down a forested path and into an ethereal clearing fit for fairies. The “altar” is composed of found timber and big boulders, and looks fantastic wrapped in evergreen boughs, billowy fabric or vibrant wildflowers. As many as 120 invitees seat themselves on half-log benches, rocks and real stumps. In early spring, the spot is often still dotted with snow. Sporty types can canoe, kayak or stand-up paddleboard across the water to a lakeside yurt, where summer after-parties for 45 can be held. Pairs who want to wed in the wild and don’t mind bringing in everything (including lighting, food, generators, bathrooms, and water!) should seek out this gorgeous, wide-open space at the base of the foothills. It can accommodate massive groups and easily lends itself to hay-bale-lined aisles, king’s table configurations, dancing under the stars and tented soirees. Shuttling from the faraway parking is another opportunity to get creative with bikes, horse-drawn carriages, even vintage fire trucks. It’s also extremely budget friendly. As long as you clean up, the Forest Service will refund rental-permit fees. Go a different kind of green at the Golden State’s highest (8,000 feet above sea level, to be exact) golf course. This summer-only spot for as many as 100 guests juxtaposes the manicured and manmade (fairways, wood carvings, bridges and duck ponds) with natural elements (towering red firs and panoramic peak views). End with a celebratory putt or photos in the “Just Married” golf cart. The course is recommended for the ceremony only, although it does have a tent for 80. While the course isn’t closed during events, golfers are re-routed to avoid the ceremony. Other looky-loos might include black bears, which have been known to lumber through the links. This quaint 1920s log cabin, which now houses the local historical museum, rents out its backyard on the banks of Mammoth Creek for small gatherings of fewer than 60 people. There’s room for a tent and a dance floor under the strung market lights. The old well, stone chimney, city welcome sign, native vegetation and the adorable abode itself provide great photo backdrops. Some furniture and a portable potty are provided, although couples can bring in upgraded decor. Because there’s no inside alternative, unpredictable weather could become an issue. Take weather worries out of the equation at this year-old indoor contemporary banquet hall, which has wood-beamed ceilings, pendant lights, an artist’s loft vibe and a floor plan that fits 350 folks. Open rafters easily lend themselves to hanging elements, such as floral pomanders or custom signs, or drape and light the entire second-story space for a more elegant effect. Either way, make use of one of the two bars as a hot chocolate station and the step-down section fronted by a wall of picture windows as a conversation lounge.